Welcome to my stop on the Fins, Wings, and Other Things blog tour, brought to you by Peachtree Press! Check out the complete schedule for the tour at Peachtree's blog! 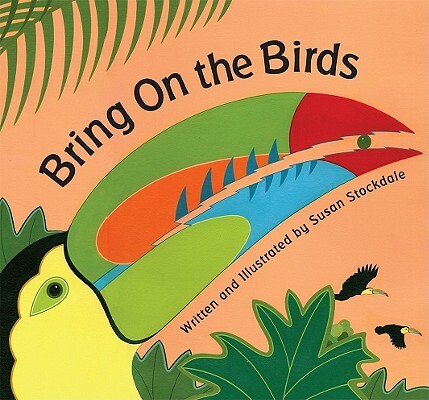 Today it's my pleasure to bring you an interview with Susan Stockdale, author and illustrator of Bring On the Birds. A: Your book, Bring On the Birds, is all about our feathered friends. How did you decide which birds to include in your book? What kind of research was involved in that decision? Do you have any favorite birds that didn't make it in? birds with tails held high. Then I headed to the library to determine: Which birds skim? Swim? Raise their tails up high? I selected birds that had the most visual appeal to me as an illustrator. And, because I celebrate biodiversity among animals in all my books, I was looking for birds from disparate geographic areas. 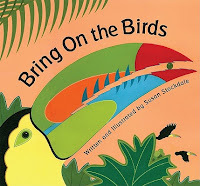 I wanted to introduce my young readers to a wide variety of bird habitats, ranging from the rainforest canopy of South America to the arid sand flats of Africa. I gathered together a number of “candidates” for each phrase. For example, for “birds with tails held high” I considered the Great Argus Pheasant, the Capercaillie and the Peacock, all of which raise their tails to attract a mate. I chose the Peacock because I was drawn to the colorful, eye-spotted patterns on its feathers. I knew they’d be wonderful to paint. I considered many different Woodpeckers before selecting the Red-bellied Woodpecker. I chose it for its brilliant red crown and intricately patterned black and white feathers, which I knew would really pop on the page. I omitted some birds that I really liked. 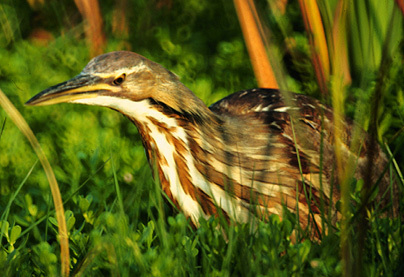 For “hiding birds,” I left out the American Bittern, a bird with colored feather patterns that camouflage it beautifully. Instead, I went in the opposite direction with an all-white bird. I included the White-tailed Ptarmigan (pronounced tar-mih-gan), hiding in a white snow bank. I was attracted to the simplicity and starkness of this image, which provided a contrast to my more colorful, detailed illustrations. Yes, my research was extensive. First, I read books, magazines, and online resources. After writing my manuscript and creating a dummy (a mock-up of the book) with the illustration sketches, I consulted with bird experts at the Smithsonian’s National Museum of Natural History, the National Zoo, and the Cornell Lab of Ornithology. These scientists assessed the accuracy of my textual and visual information. Clearly, everything that I convey to my young readers has to be correct. I also tried to see as many of the birds in my book as possible. I visited zoos and examined bird specimens at the National Museum of Natural History. My most exotic trip was to the Galapagos Islands, where I saw the Blue-footed Boobies perform their fanciful mating dance, and the Great Frigatebird puff out its scarlet chest. These were marvelous spectacles. The Galapagos trip also stimulated ideas for new books. What is something interesting that you found out in your research that didn't make it into the final book? 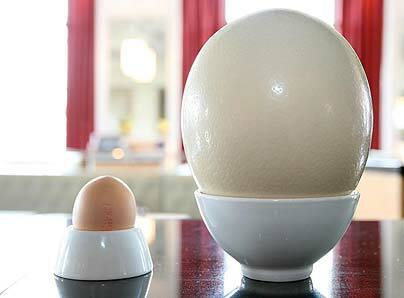 The Ostrich lays the largest bird egg in the world. You have created several picture books about animals and nature. Have you always been interested in nature? What about it fascinates you? I’ve always been drawn to nature. I grew up in sunny Miami, Florida, surrounded by lush vegetation and flowers. I played outside all the time, and my family made frequent visits to a place called the Parrot Jungle, here I was dazzled by the birds’ bright, bold colors. My family also lived in Ireland for a few years during my childhood. The Irish landscape was green and sparkly, filled with cows, sheep and other animals I'd never seen in Miami. 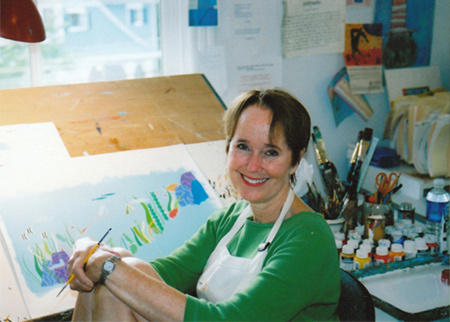 These two very different environments -- the subtropics of Miami and the magical surroundings of Ireland -- really influenced my development as an artist and sparked my interest in nature. I’m fascinated by patterns in the natural world, which are so abundant and varied. It has become instinctive for me to find patterns in everything I paint. (Before becoming a children’s book author and illustrator, I worked as a textile designer for the clothing industry, creating intricate designs for fabric.) I find the repetition in both words and images to be very soothing and reassuring, and I think children do, too. When I read my rhyming books to kids, they spontaneously clap! They really respond to the rhythm. Why do you feel it's important to create informational books for young children? What do you hope children will get out of your books? Kids don’t play outside the way I did when I was little; they’re inside on their computers or watching TV. I think that’s so sad. I’ve actually been on nature walks with children who were afraid to be there, afraid of wildlife. I create my picture books to shine a light on nature and say, “Hey! Look how beautiful this animal, or flower, or leaf is!” I hope to encourage kids to celebrate and appreciate the natural world. I hope to engage them in the beauty of language by using spare text, energetic rhyme schemes and a lot of alliteration. I am a huge fan of nonfiction picture books. What are some of your favorite nonfiction picture books or who are some nonfiction picture book authors that you admire? I’m an admirer of books by Steve Jenkins, especially Down, Down, Down, Never Smile at a Monkey and Move. He conveys information about nature and animals with such originality and elegance in both his text and intricate collages. He makes learning fun. I’m also a fan of books by Jim Arnosky, Russell Freedman, Dorothy Hinshaw Patent, Caroline Arnold and Robert Snedden. I’ve consulted their books while developing the text and illustrations for my work, and have included them in my books’ bibliographies. Great authors to check out! Thanks so much for stopping by and answering my questions, Susan! Be sure to pick up Susan's book Bring On the Birds for a great look at different birds all over the world. And be sure to check out today's other stops on the tour: an interview with Wendy Anderson Halperin over at Book Dads and a review of About Habitats: Grasslands over at A Word's Worth.